The savvy dieter is sure to be well-aware of the trendy cabbage soup diet, which promises up to 10 lbs. of weight loss by eating as much cabbage soup as you desire for seven days, along with certain other specific foods throughout the week. What may be news to even the savviest dieter of them all is that a diet made up of broccoli soup may be even more beneficial. Broccoli is a cruciferous vegetable and is a member of the cabbage family, along with Brussels sprouts, cauliflower and turnip greens. Like cabbage and all other cruciferous vegetables, broccoli is low in calories, high in calcium and is said to be a potential anti-cancer agent, according to “The Observer.” Yet out of all these cruciferous vegetables, broccoli is said to be the healthiest member of the cabbage family by far. It would make sense then that the broccoli soup diet could be healthier and possibly even more likely to help you lose weight than the trendy cabbage soup diet. Broccoli is an excellent source of vitamin C, which, according to Leslie Beck, a Canadian registered dietitian, speeds metabolism and helps promote weight loss. “Time” magazine has named broccoli one of the top 10 foods that “pack a wallop for health,” and it is not surprising given all the beneficial qualities it boasts. Besides vitamin C, broccoli also contains vitamins E and B6, as well as the cancer-fighting agent known as sulphoraphane. It is also one of the best sources of calcium, which plays a big role in weight loss. Broccoli is also rich in anti-oxidants and contains glutathione, which is known to enhance the immune system. Broccoli is also a good source of fiber, which prevents constipation and other bowel conditions. Eating fiber is known as a good weight-loss tactic, as foods high in fiber take longer to digest, leaving you feeling full for a longer period of time. According to the “Toronto Sun,” adding 10 g of soluble fiber is just as effective at lowering blood cholesterol levels as lowering your fat intake, which means that fiber has been shown to be very effective in lowering weight. Soup is known to be an appetite suppressant because the combination of liquids and solids found in soups is said to decrease hunger. A soup diet is also known to help you lose weight because it dilutes calories. 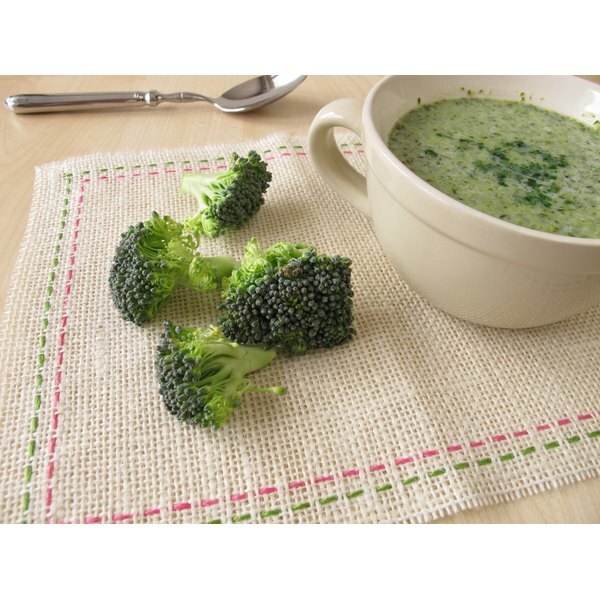 A broccoli soup diet would have all the ingredients to help you lose weight as well as keep your immune system healthy. You might want to try this recipe from “The New York Times”’ Food and Fitness Section: Peel and cook potatoes with a sliced onion in a little water, then add one bunch of chopped broccoli and simmer for an additional 15 to 20 minutes. Next, puree the vegetables and broth in a blender. It is not necessary to puree the entirety of the vegetables if you would like to include some solid chunks of veggies. Add skim milk and yogurt to thin and season to taste. As with all diets, it is smart to be wary. Dietitian Lisa Sutherland would agree that a broccoli soup diet, like a cabbage soup diet, will result in weight loss, but warns that you will probably regain the weight lost once you begin eating solid foods again. Susie Langley, a Toronto nutrition consultant says, "When you cut carbs, you lose water weight." The broccoli soup diet is relatively low in carbs, which means you should lose weight by cutting carbs, but it may only be in water and it may return once you start eating regularly again. The broccoli soup diet, seemingly an offshoot of the cabbage soup diet, never gained enough popularity to earn its own website. Some followers treat the broccoli soup diet as a substitute for the cabbage soup diet, which involves eating a lot of soup and specific foods on different days of the weeklong diet--bananas and milk one day, beef another. Some eat broccoli soup exclusively and some include the soup at one or two meals that also include lean protein and carbohydrates.The nutritional benefits of broccoli make broccoli soup a healthy choice as a regular menu item, but would be an extreme diet if eaten exclusively or as a substitute for the cabbage soup diet. What Is the Nutritional Value of Cooked Broccoli? Does Broccoli Have Vitamin K in It?